Marinate steak in a mixture of spices, lime juice and tomato sauce for flavor you'll love. 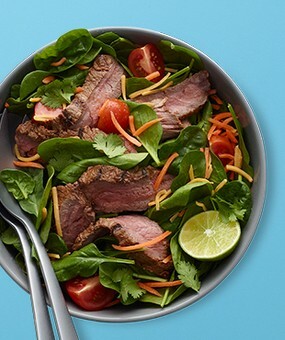 Pair it up with fresh greens and a lively dressing for a steak salad you'll want to make again and again. Dovetailing Tip: Double the meat and marinade so you have extra to use in other meals, like the Carne Asada Burrito for Meal 3. Combine marinade ingredients in large plastic food storage bag. Add steak; seal bag. Massage bag to coat steak. Refrigerate 8 hours or overnight. Heat grill. Grill steak, about 6 minutes per side for medium, until desired doneness, turning halfway through. Let rest then thinly slice. To assemble salad, toss spinach, carrot and cheese in large bowl. Top with slices of grilled steak. Drizzle dressing over salad. Garnish with fresh cilantro leaves and squeeze of fresh lime, if desired.